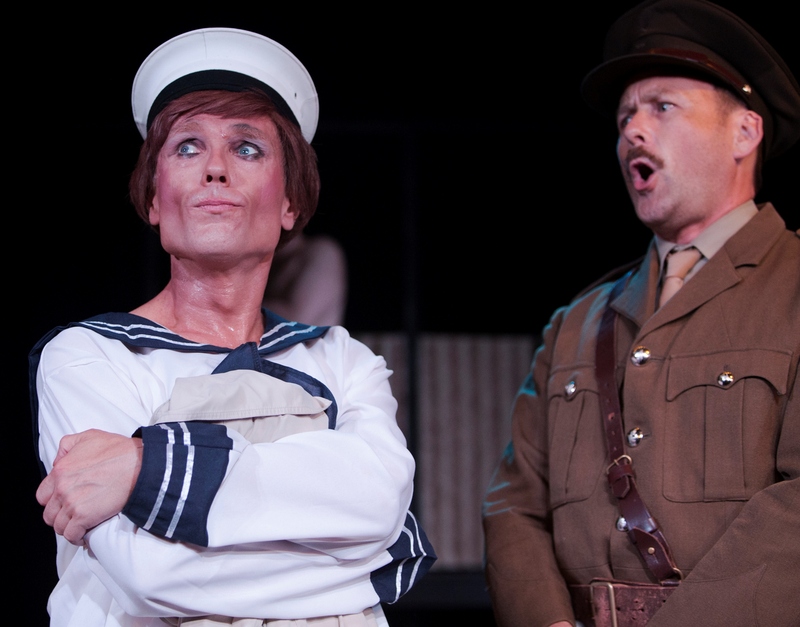 Peter Nichols’ Privates on Parade is a fruity, somewhat dated affair, old love – but beneath the camp humour it has serious things to say about sexual politics, racism and colonialism, which still strike a chord. The 1977 play with music was based on Nichols’ own personal experience of doing National Service in Calcutta and then Singapore as part of the Combined Services Entertainment alongside the likes of Kenneth Williams and Stanley Baxter. Set in Malaya in 1948, it follows the naïve Private Steven Flowers (David Hooley) who is sent to investigate corrupt goings-on at the Song and Dance Unit South East Asia, a rag-tag bunch of misfits (both straight and gay) whose job it is to entertain the British troops fighting Communist Insurgents. There, Flowers meets Acting Captain Terri Dennis (James Lee), a flamboyant drag queen who directs and stars in the unit’s shows, and becomes romantically involved with a local Welsh-Indian beauty called Sylvia Morgan (Diana Perini) who longs to leave for London. Staged by the New Theatre as part of Mardi Gras, Alice Livingstone directs an exuberant production that gives full vent to the show’s camp humour and production numbers, including a ballet, a tap routine and some truly terrible jokes. Trent Kidd’s choreography suits the piece perfectly and has some nice humour built into it. There’s also a tastefully handled shower scene in which some of the privates’ privates are briefly on parade. But alongside the frivolity there are darker elements including the arrogant ordering around of the Asian servants, Flowers’ cavalier treatment of Sylvia, the behaviour of the abusive, corrupt, homophobic Sergeant Major Reg Dummond (Matt Butcher) and the sudden eruption of war-time violence. Lee drives the show as the camper-than-Chloe Terri, all jutting cheekbones and arching eyebrows as he relishes each and every double entendre. His impersonations of Marlene Dietrich, Vera Lynn and Carmen Miranda are played to the hilt, but he then reins in his Noel Coward number beautifully. As well as Terri’s flamboyance, Lee captures his loneliness, loyalty and generous spirit, particularly in his care of Sylvia. It’s a lovely performance. Hooley is very good as the essentially decent Flowers, Peter Eyres is commanding as Major Flack, an unbending military man with a Christian fervour, and Perini is affecting as Sylvia, proving herself a genuine triple threat. They are generally well supported by the rest of the cast: Morgan Junor-Larwood, Henry Moss, Jamie Collette, David Ouch and Gerwin Widjaja. If the production is a bit rough around the edges at times, somehow it seems to suit the piece with its knockabout energy. Livingstone’s decision to have Moss, Ouch and Widjaja as The Boogie Woogie Bugle Boys in satin cheongsams singing in the foyer and then on stage before the show is a nice touch. Not only does it set the mood but it allows Ouch and Widjaja to strut their stuff, since they get to say nothing in the play as servants. All in all, an enjoyable evening. This entry was posted in Musical Theatre, Theatre and tagged Alice Livingstone, David Hooley, David Ouch, Diana Perini, Gerwin Widjaja, Henry Moss, James Lee, Jamie Collette, Mardi Gras, Matt Butcher, Morgan Junor-Larwood, New Theatre, Trent Kidd by jolitson. Bookmark the permalink.